ranger and head miller tells visitors, "We could grind 600 to 800 pounds of flour every day if we had to, just as they did years ago." When the European Priests first arrived in Texas to build the Missions the only type of bread they found was "Corn" bread. Corn can be milled by hand but to mill the harder wheat grain required some type of mechanical mill. 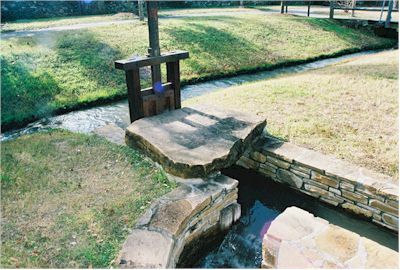 A logical addition to the extensive irrigation canal system from the San Antonio River, was a water powered mill. The mill at San José is not a technological wonder even when compared to water powered mills of that day. A gate directed water into a deep tub. 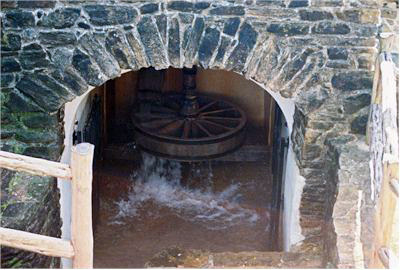 Water from the tub was throttled with a smaller gate out through a small wooden pipe onto the horizontal vanes of a water wheel attached to a vertical shaft. 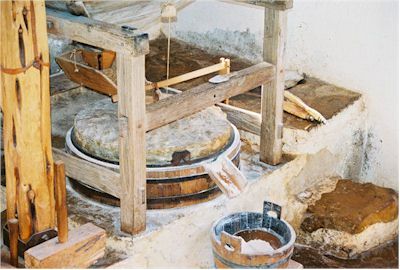 The vertical shaft went up through the mill floor, through the stationary millstone and was attached to the upper mill stone. The upper mill stone was turned by the shaft. The miller slowly fed grain into a hopper. The hopper is like a scoop. The hopper slowly drops the grain into a hole in the center of the upper stone. The grain is ground up between the stones and comes out one side into the flour bucket. The flour was used to make bread for everyone who lived in the Mission. If there was extra flour it was traded with the other Missions in the area. 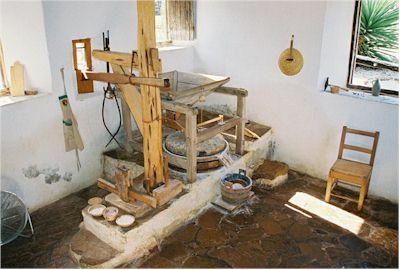 Gristmills played an important role in frontier Texas, as they did elsewhere. Early settlers required and developed ways to turn grain into flour to make bread, the most universal of foods. Farmers grew wheat and corn for sustenance as well as profit. Large plantations had their own mills. Small communities had at least one mill-ideally no more than a day's ride from area farms. A farmer would sling a sack of corn or wheat across a horse or mule, ride to the mill, and bring home the same sack filled with meal or flour.